After nearly six years in operation, the high profile solar panel manufacturing company, Solyndra, will file for bankruptcy. And so, on August 31st, 2011, Solyndra announced it would immediately be suspending its manufacturing operations and laying off 1,100 employees. The decision deals a particularly heavy blow to the Obama administration, which provided a $535 million federal loan guarantee to the company in 2009. Solyndra was only 1 of 40 investments the Obama administration made in renewable energy with its U.S. Department of Energy loan program. The purpose of the program was to inject necessary financing into the green energy sector and provide 60,000 jobs. Despite Solyndra’s bankruptcy, the White House claims its investment portfolio is still doing well and remains on track to generate thousands of jobs. But the failure of Solyndra’s brings forth questions about the suitability of government funding that goes towards particular companies or technologies. Should the government be trying to pick winners with its investments or should it implement a more broad approach? Bernstein believes government approaches should focus more on basic research and traditional stimulus projects rather than trying to focus on only certain companies. Do you agree with Bernstein? What role do you think the government should play in generating growth in the green sector? 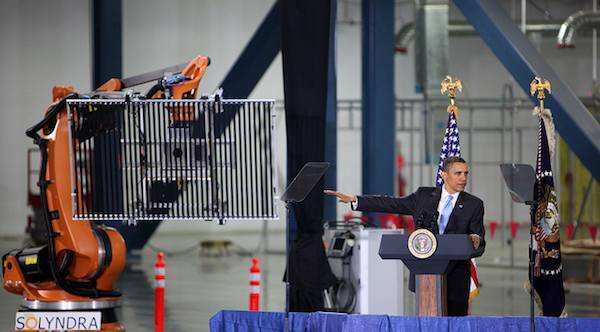 Image CC licensed by Steve Jurvetson: President Obama visiting Solyndra in 2010.